I studied Medicine and did my postgraduate ophthalmic residency in India. Thereafter I moved to UK and continued my higher specialist training in Ophthalmology and worked in many prestigious eye hospitals including Sheffield, Leeds, Birmingham and Nottingham University hospitals. My special interests are cataract surgery, medical retina including age related macular degeneration & diabetic retinal diseases, general ophthalmology and refractive laser & lens exchange surgeries. 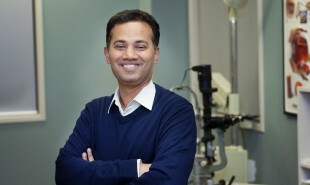 I have been practicing as a specialist eye surgeon in Hamilton since 2008. Currently, I am the Clinical Director for Ophthalmology services at Waikato Public Hospital and have private clinics at Hamilton Eye Clinic, Pohlen hospital in Matamata, Bridgewater day Surgery and Laser Eye Centre.